"You can't just decide to fix things!" The Orchard has unveiled the first official trailer for an indie dramedy called The Hero, from writer/director Brett Haley. 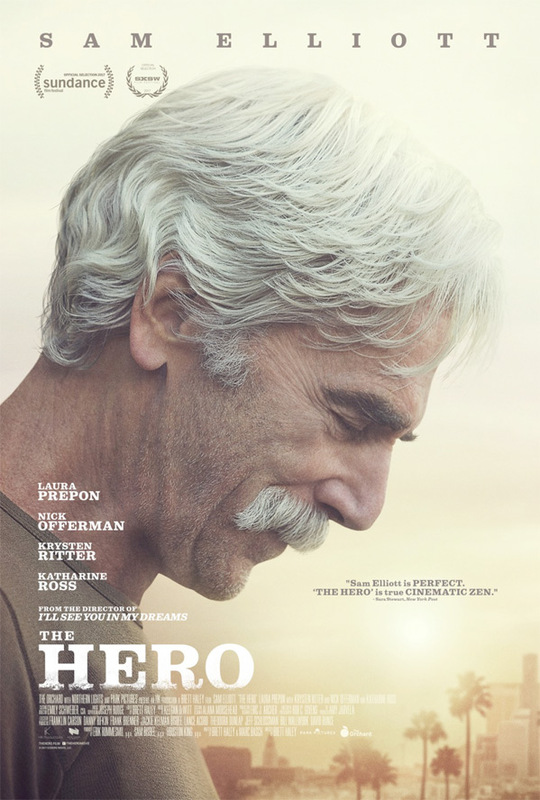 The film stars Sam Elliott as "The Hero", basically he's playing himself, an "aging Western icon with a golden voice, but his best performances are decades behind him." He tries to deal with his own demons while falling for a young stand up comedian, played by Laura Prepon. The cast also includes Krysten Ritter, Nick Offerman and Katharine Ross. This premiered at the Sundance Film Festival and also played at SXSW to mostly positive reviews. This is actually a damn good film, with some great performances from Elliott, Prepon, and Offerman. As much as this seems like a comedy, there's a humble and emotional side to this that makes it even better than it seems at first glance. Lee Hayden (Sam Elliott) is an aging Western icon with a golden voice, but his best performances are decades behind him. He spends his days reliving old glories and smoking too much weed with his former-co-star-turned-dealer, Jeremy (Nick Offerman), until a surprise cancer diagnosis brings his priorities into sharp focus. He soon strikes up an exciting, contentious relationship with stand-up comic Charlotte (Laura Prepon), and he attempts to reconnect with his estranged daughter, Lucy (Krysten Ritter), all while searching for one final role to cement his legacy. The Hero is directed by filmmaker Brett Haley, of the films I'll See You in My Dreams and The New Year previously. The screenplay is by Brett Haley and Marc Basch. This first premiered at the Sundance Film Festival earlier this year, and also played at the SXSW and San Francisco Film Festivals. The Orchard will open The Hero in select theaters on June 9th this summer.